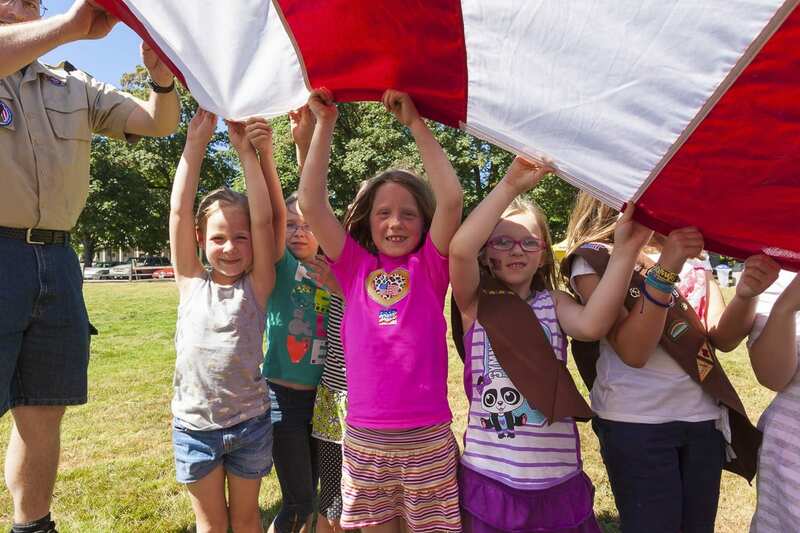 VANCOUVER — On Thu., June 14, area residents can celebrate Flag Day with the community at the 24th annual Flag Day at Fort Vancouver, a free family event presented by The Historic Trust and Davidson & Associates Insurance. The celebration begins at 5 p.m. at The Bandstand at Fort Vancouver National Site, across from the Grant House, 1101 Officers Row. The Flag Day ceremony will include a presentation of the colors by the 142 FW Base Honor Guard, National Anthem performed by Northwest Harmony Chorus, raising of the Garrison flag (the largest size American flag used by the army) by the National Parks Service, US History Quiz (Sunset Elementary 5th Grade Students vs. Clark County Mayors), and the annual Clark County Mayors’ Patriotic Tie Contest. 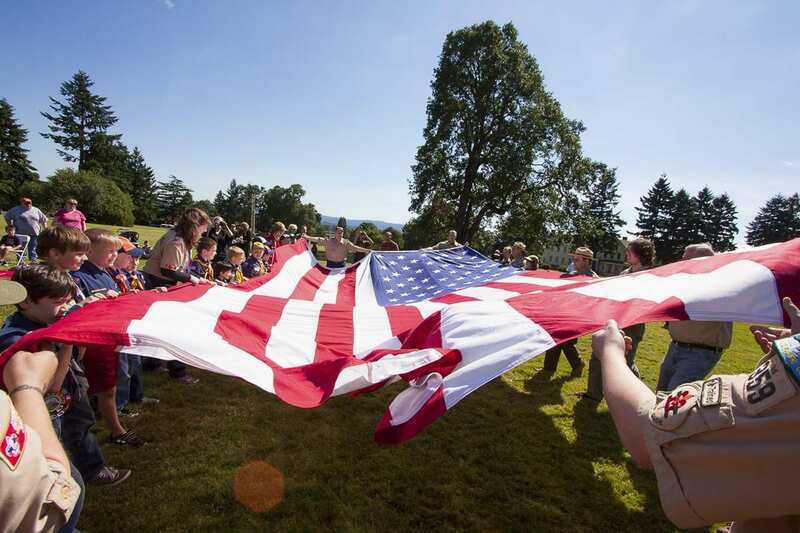 The ceremony is followed by patriotic kids’ activities including learning proper flag etiquette, singing patriotic songs, mastering marching, touring a historic landmark, and coloring Washington state symbols. Activities are free and open to the public, and Brownie Girl Scouts have the opportunity to earn their Celebrating Community badge by completing the activities. Pre-registration required to earn badge, visit https://thehistorictrust.org/girl-scout-flag-day-badge-registration-form/ to register. Flag Day at Fort Vancouver is a part of The Historic Trust’s Celebrate Freedom program, a series of festive and educational events and programs aimed at inspiring all generations and strengthening community values of leadership, public service, patriotism and lifelong learning. The Historic Trust’s Celebrate Freedom program includes favorite community events like Vancouver’s Fireworks Spectacular on the 4th of July, The Veterans’ Parade, The Marshall Public & Youth Leadership Awards, and Marshall Lectures. In addition to sponsoring Flag Day at Fort Vancouver, Davidson & Associates Insurance is holding a free community Flag Exchange for the third year running. From June 11-15, 8 a.m. to 5 p.m., residents can exchange their old US flag for a new 3’ x 5’ flag at the Davidson office, 610 Esther Street, Suite 101 in downtown Vancouver. New flags are available while supplies last, Davidson will accept all old US flags for retirement. Exchanged flags should be removed from poles and dried if wet. Fort Vancouver District Boy Scouts of America will perform proper flag retirement ceremonies for all exchanged flags. For more information on the Flag Exchange, contact Davidson & Associates Insurance at (360) 514-9550. The Historic Trust is a 501(c)3 nonprofit organization with the mission to inspire civic pride and economic vitality through education, celebration, and preservation of the Southwest Washington community’s history. Learn more at www.thehistorictrust.org.